Not everyone is born with long, thick glamorous eyelashes, but what a difference beautiful lashes can make! Your eyes are one of your most noticed facial features, and lashes help to frame your eyes just as a frame accentuates a beautiful work of art. If your lashes are not quite as voluminous as you would like, then eyelash extensions from The Retreat Salon in New Orleans are a way to achieve those gorgeous lashes instantly. Imagine never having to use mascara again! No clumping, no mess, just lovely length that will frame your eyes with unbelievable volume. Not all eyelash extensions are the same. Our New Orleans hair salon has carefully selected only the highest quality products to use for our lash extension services. We use an innovative brand of extensions known as 3D Lashes that provides natural looking results and a comfortable application process. 3D-Lashes are eyelash extensions that allow you to enjoy longer, fuller eyelashes. 3D-Lashes are weightless and made to look identical to human lashes for a completely natural look. The lashes are made of a synthetic material which is very soft and naturally curved. They are applied to your real lashes one at a time by one of our specialists during a very relaxing and comfortable procedure. These eyelash extensions are waterproof so you can shower, exercise and even sleep with them on! The technology behind this particular brand allows your extensions to last up to 2 months. What is the difference between 3D-Lashes and other eyelash extensions? There are many differences. Traditional false eyelashes normally come in a strip with lots of lashes attached together and they are applied to the eyelid with an adhesive that dries on the lid. This procedure can cause a great deal of discomfort and it can actually cause your natural lashes to become damaged and fall out. False eyelashes normally last only a few days. By contrast, our 3-D lashes look identical to your real lashes. They are attached with a very special adhesive that adheres the lashes one at a time to your natural lashes. The adhesive uses a polypeptide bond that allows lashes to remain flexible and bouncy. 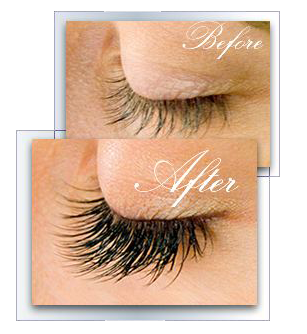 3D-Lashes are weightless, very comfortable on the eyes, and will not prematurely cause your natural lashes to fall out. Normally up to 2 months. How long does it take to have eyelash extensions applied? It can take between 50-90 minutes for a full set to be applied at our salon. The approximate amount of lashes applied is around 60 lashes for both eyes (30 on each eye). The natural life of the lashes is about 100 days. Your own eyelashes will grow out on a continuous cycle, so touching up the 3D-Lashes will help to maintain the fullness of lush lashes. Re-touching is highly recommended every 2-3 weeks. It should take 10 - 30 minutes for the touch-up procedure. Jet Black, Espresso Brown, Burgundy Red, Velvet Purple, Midnight Blue and Mountain Green are available at our salon. Size availability ranges from 8mm - 15mm. Make an appointment today for gorgeous eyelash extensions at The Retreat Salon in New Orleans, and discover just how beautiful your eyes can be!